So, I turned forty recently. FORTY. For the most part, I like birthdays and I have no problem getting older. But for some reason, this one is throwing me for a bit of a loop. Maybe it’s because I’m a mom now, and being a mom is making me nostalgic. And being nostalgic means I’m remembering all the fun things I’ve done over the years (many, MANY years) and for the first time feeling like the door is starting to close a little in my life. Turning 30 was not like this. Turning 30 felt like centering myself – letting go of the young me and embracing the adult me. Turning 30 was about recognizing that my life was solid, that I was several years into a great career and equally strong in my still-somewhat-new marriage. Forty, on the other hand? Apparently 40 is when I have to own up to the fact that I will never be a backup dancer for Justin Timberlake, or a star soccer player on the US National Team, or an award-winning architect, or any number of other things I occasionally dreamed of in my younger years. I might still live in another country and I could learn another language or two, but even those things are starting to fade from the realm of “likely”. Forty is when I realize that being in the best shape of my life might actually be right now and not still to come. Or, maybe it was ten years ago and I totally did not know it at the time. Where 30 came with the knowledge that I finally had a true sense of stability in my life, 40 doesn’t seem to be throwing me an “up” side. Which, to be fair, is because my life is pretty stinking great and there isn’t much more “up” to pack in it. So, I feel a bit unsettled. I’m 40. It’s a whole new decade, and I have no idea where it’s headed or what it’s all about. And I don’t even have time to figure it all out because I’m busy running around like a crazy person after my 2 year old and 7 month old – which I totally did not expect to be part of my life plan ten years ago. At least there are cherries. And chocolate. Cherries and chocolate can get me through a whole lot of chaos. Throw in some good wine and I might just make it to age 50. 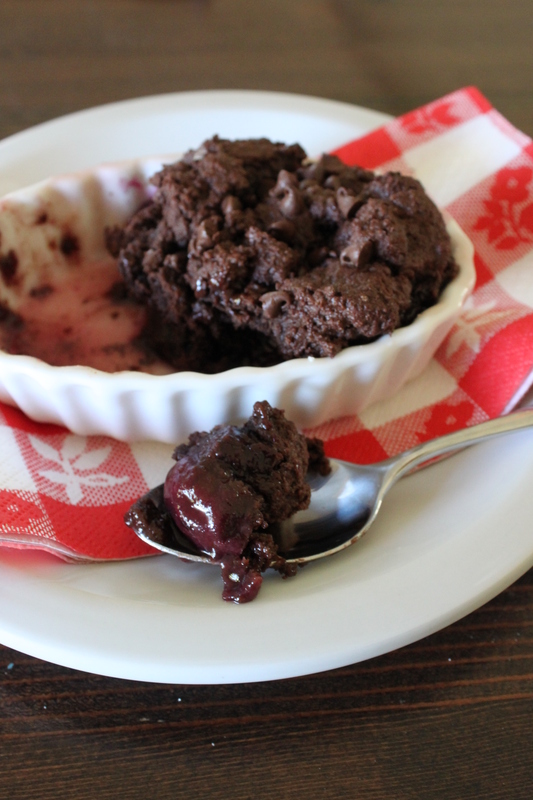 Right now when you can get amazing, farm fresh cherries (in the Pacific NW, at least) this is a quick and easy way to enjoy them in a decadent dessert. If you can’t get fresh cherries or if you want to skip the mess of pitting them, go ahead and use cherry pie filling in place of the filling here. Preheat oven to 375 degrees. Place the cherries in a bowl and toss lightly with flour and sugar. Divide between ramekins – pile it into 4 dishes if you like lots of filling, or spread it in 6 dishes if you like a higher ratio of topping to filling. Set aside. Prepare the cobbler topping – in a food processor combine flour, sugar, cocoa powder, baking powder and salt. Pulse a few times to mix. Add egg, milk, and vanilla and pulse just until mixture comes together into big, crumbly chunks. Pile the crumbly mess on top of each cherry-filled ramekin, pressing lightly to make sure it stays put. If you have extra topping when you’ve finished, smush it together into biscuit shapes and bake along with the cobblers – instant chocolate scones! 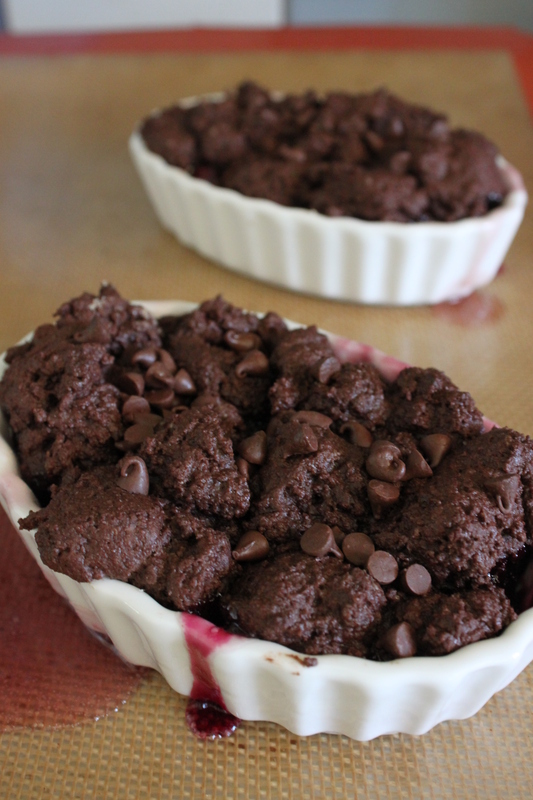 Sprinkle mini chocolate chips on top of each cobbler, if desired. Place the cobblers on a lined baking sheet to catch drips and bake 15-18 minutes or until juices are bubbly and cobbler topping is set. Do not overbake or cobbler will be dry. Makes 4 to 6 servings. That’s a great quote, Pappy! And…wait until you get to be 60…and are still imagining your next career. It will be fun.